THIS YOU'VE GOT TO SEE!!! Blue Ribbon, Beautiful All Brick Home, In-Ground Pool, 30 x 36 Shop that sits on an Acre Lot. OH YES there is More â Much More!!! You will want to make this your Home as soon as you enter the driveway and be Greeted by the Colorful Landscaping and Butterflies Dancing amongst the Flowers. The Front Porch says âWelcomeâ. Step inside and be Wowed by the many Upgrades and Amenities while you Stride across the Stunning Hardwood Floors from Living Room, Dining, Kitchen, Bedroom and the Hallway. 5 Generous Size Bedrooms, 3 Full Baths with Granite Counters, & Main Floor Laundry. The Master Suite is your private Oasis and has a Coffered Ceiling-Crown Molding-Rope Lighting. The Master Bathroom Highlights are: the Double Sinks, Private Toilet Room, Whirlpool Tub, Separate Over-Sized Shower and Walk in Closet with high hanging for off season clothing. Like to Cook? The Gourmet Kitchen is nothing less then Incredible with Knotty Alder Woodwork complimented by Granite Countertops. The Kitchen Features a Hidden Pantry, a Newer 5 Burner Gas Cooktop, Newer Double Oven, Newer Microwave, a Dishwasher, and even the Kitchen Refrigerator will remain! Relish in the Scenic Views of the Outside in every Season from the BIG Picture Windows in the Dining Room. The Stoned Fireplace in the Hearth Room is sure to please. Just off the Kitchen is the Laundry Room with Folding Table, Sink with Granite Top. The Walk-Out/View-Out Basement includes Family Room/Wet Bar with Gorgeous Granite, Two Bedrooms, Full Size Bath and an Amazing amount of Storage Space. The Covered Deck off the Kitchen or Covered Patio from the Basement will most likely be the HUB of this home as you pull up a chair any time of the day and be entertained by Natures Beauty. Priceless Views you won't see in the City! Let's take a Walk Outside! Spring, Summer & Fall get a whole lot Better in your very own Staycation 18 x 40 In-Ground Pool. Pool has a new electric retractable pool cover w/ new water removal pump to rid cover of rain water, etc. Protect your pet and keep them home with the newly installed Invisible Fence system that surrounds the property providing maximum play room. A Dream Come True 30 x 36 Detached Garage with electricity and an RV plug. The âShopâ has insulated walls and ceiling covered with 7/16 OSB Wood Sheeting. New Energy Efficient LED Ceiling and Work Bench Lighting. Storage Area in âShopâ Attic has New Lighting and Stairway Access. 3/4â Black Pipe Plumbed in to allow Gas Heater Installation. The rear overhead door will make it easy to get your lawnmower out. The Oversized 3 car attached garage has openers on both doors. Energy efficiency items include Tech Shield roof decking on both the house and the detached garage, blown cellulose insulation in walls and ceilings of house, hi efficiency HVAC with humidifier, and low E vinyl casement windows. The Lush Landscaping is maintained by the 24 Station Sprinkler System and Irrigation Well. 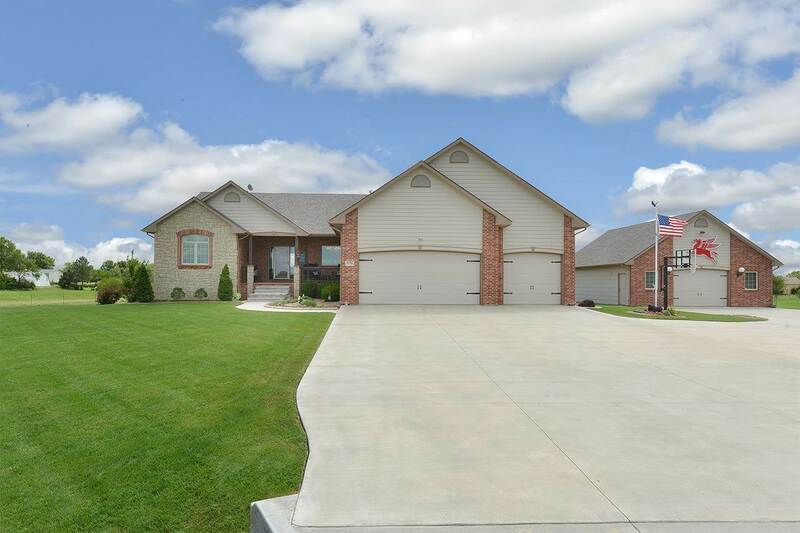 This Home OVER ACHIEVES and is sure to meet all your Expectations! Luxury Living & Choice Location! Just minutes from the NW YMCA & New Market Square. Put this on your MUST SEE List! Call Today to View.